SCE Screen Capture allows you to use any area of your Windows Desktop / Monitor / Screen and capture its content in order to directly bring it into MADRIX. In this way, you can integrate any other software and their output into MADRIX [such as visualizers, presentations, and more]. 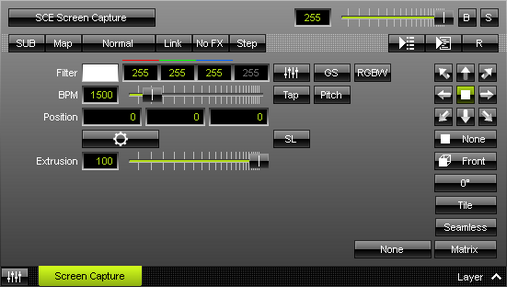 Basically anything that you can show on your monitor can also be brought into MADRIX. ▪ In order to use this MADRIX Effect, click Configuration first. ▪ Configure the Screen Capture Configuration as required and as explained below. These settings affect the performance of the screen capturing. Screen capturing can require a considerable amount of computer performance! ▪ Turns off the Windows desktop composition system called Aero in Windows 7 [which is used for visual effects of the Windows user interface]. MADRIX will check first if the Aero is enabled. - It is recommended to turn Aero off. This increases the capture frame rate! - If you activate Aero Off, it will be turned on again once you close the MADRIX software. 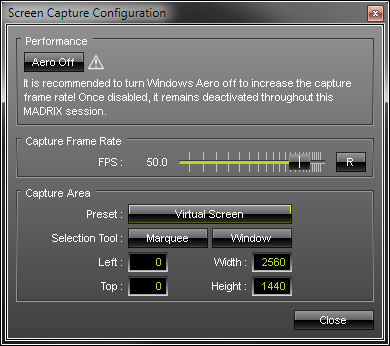 ▪ FPS - Defines the frame rate with which MADRIX captures the content. These settings define the screen area that is used for the screen capturing. Custom Size - Defines a custom area as the capture area. - Is automatically selected if you use a Selection Tool or define a Custom Area. Monitor - Defines a complete output of one monitor as the capture area. The available selection choices depend on the configuration of monitors in Windows [e.g., if one or more monitors are installed]. Virtual Screen - Defines the complete screen output of Windows as the capture area. This often includes all monitors, for example. Marquee - Allows you to define a capture area via your mouse and keyboard. - Click Marquee and an overlay will be shown. - You can freely move the overlay around in order to position it correctly. - To do so, use the mouse [left mouse click and hold and drag the overlay window]. - Or use the arrow keys on your keyboard [Left, Right, Up, Down]. - You can freely change the size of this overlay in order to set up the correct size. - To do so, use the mouse and drag the edges of the overlay. - Shift + Up/Down - Reduces the Height. - Ctrl + Up/Down - Increases the Height. - Shift + Left/Right - Reduces the Width. - Ctrl + Left/Right - Increases the Width. - The upper left coordinates of the overlay [Left, Top] are always displayed in the upper left corner. - The lower right coordinates of the overlay [Right, Bottom] are always displayed in the lower right corner. - The Width and the Height of the overlay are always displayed in the center. - Escape / Enter / Left Mouse Double-Click - Confirms your selection. Window - Allows you to quickly choose a specific window to use as capture area. - Click Window and an overlay will be shown that covers complete windows. - You can freely choose which window should be used as screen capture area. - Move the mouse to select the window via the overlay. - Use Ctrl + left mouse click in order to select specific parts of a window [e.g., to select only a specific area of an application]. ▪ Define an individual screen capture area by using the four input fields. Left and Top - Define the start coordinates in a coordinate system that starts with 0,0 in the top left corner. Width - Defines the total horizontal size of the screen capture area in X. Height - Defines the total vertical size of the screen capture area in Y.